Scoring – Brussels: Dominick DeFazio 16; AFNORTH: David Mitchell 21, Luke Priestman 14, Keoni Gallman 4. Noteworthy – Priestman totaled 8 assists, 4 rebounds and 4 steals; Gallman produced 9 rebounds and 3 steals. Scoring – Marymount: Gianmaria Bellucci 16, Fracisco Necco 14; Rota: Andy Drake 24, Joseph Perches 15. Noteworthy – Drake (13), Perches (10) and Bellucci (10) cracked double-digits in rebounding. Scoring – Ansbach: Ogden Andrew 24, Kevin Kamara 12; Hohenfels: Wade Cooper 23, Herold-Adams 15. Noteworthy – Cooper led all rebounders with 12 in a double-double effort; Nick Benson (7), Kamara (6) and Andrew (6) contributed on the boards for Ansbach; Andrew made 5 three-pointers. Scoring – Hohenfels: Walker 20, Cooper 5; Ansbach: Kamara 28, Andrew 24. Noteworthy – Andrew had 13 rebounds, 6 steals and 5 assists for Ansbach, while Kamara had 7 rebounds and Nick Benson 6 for Ansbach. Scoring – Kaiserslautern: Isiah Washington 12, Santo Starkey 9; Wiesbaden: Jaylen McFadden 15, Josh Osakwe 11. Noteworthy – Tre’ Dotson had 8 rebounds for Kaiserslautern, while Osakwe filled up the stats sheet with 14 rebounds, 6 assists and 4 steals. Scoring – Aviano: Mason Shine 20, Traevian Ware 6, Ben Broome 5; Vicenza: Jayden Owens 17, Abrein Brown 17, Kai’re Grant 16. Scoring – Vicenza: Owens 13, Donavan Gragg 9, Micah Dejardin 7; Aviano: Ware 18, Shine 6. Noteworthy – Ware scored the Saints’ final 9 points. Scoring – Lakenheath: Jordan Harris 11, Daniel Velmen 11, Grady Wright 10; SHAPE: Jevon Wong 15, Chander Squire 10, Jose Garcia 5. Noteworthy – Squire had 6 rebounds for SHAPE. Scoring – Lakenheath: Kobe Cox 15, Velmen 12, Wright 11; SHAPE: Squire 12, Wong 10, Anthony Gorden 8. Noteworthy – Squire had 8 rebounds for SHAPE. Scoring – Alconbury: Jose Cordero 17, Monroe Potter 7; SHAPE: Marios Giannopoulos 16, Garcia 10, Squire 7. Noteworthy – Potter had 13 rebounds for Alconbury, while Giannopoulos had 8 and Squire 5 for SHAPE. Scoring – Ramstein: Naser Eaves 33, Jason Jones Jr. 14, Sincere Dudley 10; BFA: Jacob Fortune 24, Dillon Priest 17, Gabe Kruse 9. Noteworthy – Dudley had 17 rebounds and Eaves 8 for Ramstein; while Kaden Proctor grabbed 10 for BFA and Kruse had 7 steals. Scoring – Ramstein: Eaves 36, Gabe Fraley 8, Jones 6; BFA: Fortune 16, Priest 15, Kruse 8, Proctor 8. Noteworthy – Eaves had 12 rebounds and Jones 8 for Ramstein, while Trevor Braaten led BFA with 9 and Josh Kirkpatrick and Proctor had 7 apiece. Scoring – Wiesbaden: Serenity Owens 10, Corban Jackson 10; Kaiserslautern: Le’Jhanique Brown 14, Imaya Sharpe 6, Brooke Fitzpatrick 5. Noteworthy – Leading rebounders included Wiesbaden’s Amani Robinson (10), Owens (9) and Allison Urick (8) and Kaiserslautern’s Sharpe (5) and Haylee Smith (5); Cece McKenzie added 4 assists in the win. Scoring – Ramstein: Reinha Williams 10, Shemilia Johnson 10; BFA: Grace Wettstone 11, Katie Greathouse 10, Kennedy Wilbanks 10. Noteworthy – BFA’s Wettstone and Jessie Campbell tied for game-high honors with 11 rebounds, while Campbell added 3 steals; Johnson had 6 rebounds and Williams 5 for the Royals; Yhari Dupree had 6 steals for Ramstein; Greathouse made a pair of 3-pointers. Scoring – Ramstein: Mari Shannon 6, Yhari Dupree 6; BFA: Becca Losey 17, Jessica Campbell 8, Katie Greathouse 5, Grace Wettstone 5. Noteworthy – Campbell had 25 rebounds for BFA, and Losey added 10. Scoring – Rota: Laniya Chester 12. Noteworthy – Chester added 8 rebounds. Scoring – Ansbach: Katelynn Patterson 22, Shermaine Nesbitt 6; Hohenfels: Jael Shain 14, Billyanna Garland 10, Atleigh Hardaway 6. Noteworthy – Ansbach’s Shanice Kamara led all rebounders with 14, while Patterson and Rona Denuna added 4 apiece for the Cougars; Maddy Black paced the Tigers with 12 boards, while teammate June Smith grabbed 7; Nesbitt added 7 steals and 3 assists. 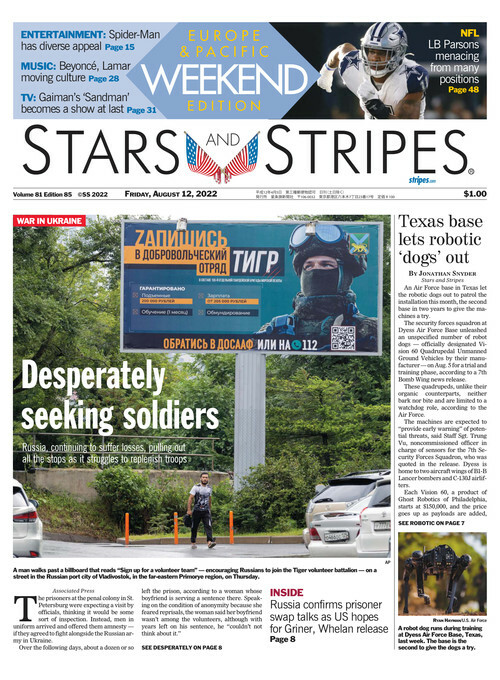 Scoring – Hohenfels: Garland 11, Smith 2; Ansbach: Patterson 17, Kamara 7, Nesbitt 6. Noteworthy – Kamara had 15 rebounds and Patterson 12 for Ansbach and Nesbitt 4 steals. Scoring – Vicenza: Amy Silbaugh 15, Angelina Lepez 7, Shoshana Rogers 7; Aviano: Tatyana Valenzuela 9, Jasmine Vasquez 7, Sara Blechinger 4. Noteworthy – Layla Thomas had 8 rebounds and Valenzuela 7 for Aviano. Scoring – Vilseck: Tedeja Marshall 18, Tynniesia Wilson 4; Stuttgart: Adan Maher 6, Allyson Taylor 6, Skye Dasilva Mathis 6. Noteworthy – Marshall had 9 rebounds and Rebekah Heckert 8 for Vilseck, while Wilson had 7 steals. Taylor had 11 rebounds and 4 steals, while Maher had 5 rebounds and 4 steals. Scoring – Vilseck: Marshall 12, Heckert 4, Kayla Silden 3, Wilson 3; Stuttgart: Taylor 12, Maher 10, Dasilva Mathis 7. Noteworthy – Marshall had 7 rebounds for Vilseck, while Taylor had 7 rebounds and 4 steals and Dasilva Mathis 6 rebounds and Rachel Johnson 5 for Stuttgart.